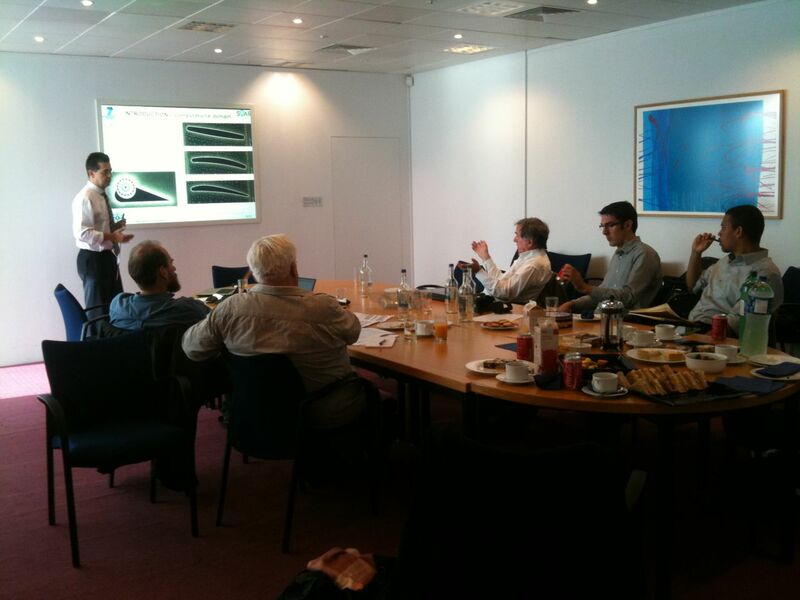 DLR are presenting material on the EU-funded SOAR project based on the FanWing technology. A workshop on the SOAR project will also be held at the show Wednesday June 17 from 15.00-17.00, by invitation. For more details click on image below. The FanWing company has now formally completed its first year of the two-year European Union joint project, working with the German Aerospace and Space Research Centre DLR, the University of Saarland and the Belgian Von Karman Institute. 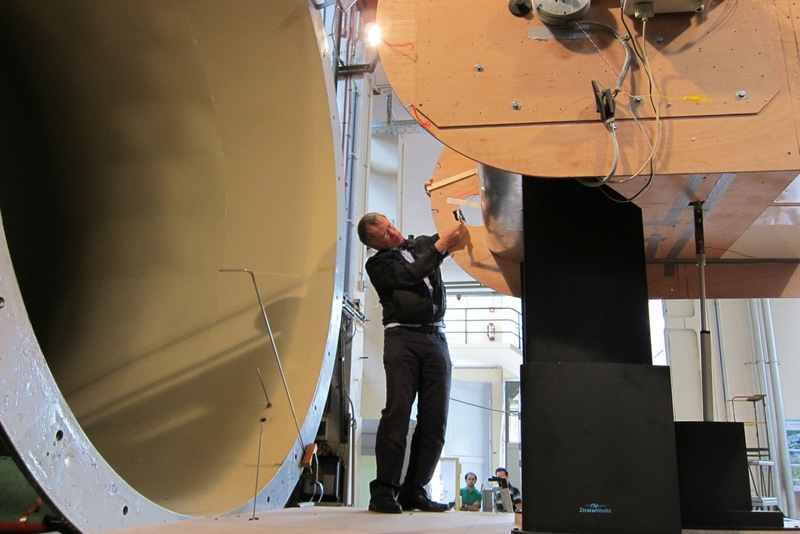 Wind-tunnel tests at the Von Karman Institute 2014. The FanWing company is pleased to announce that it has become joint recipient for a European Union Award. 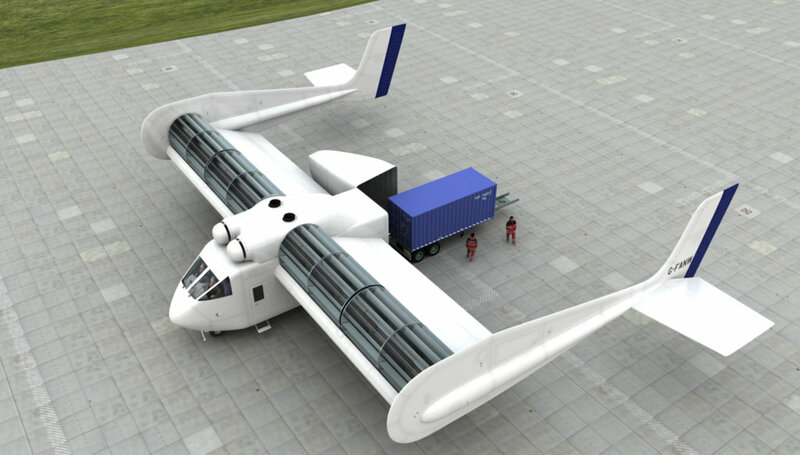 The new two-year research and development SOAR project aims to optimise the originally patented FanWing rotor and wingshape and explore feasibility of a full-size cargo-lifting FanWing (see image below). DLR, the German Aerospace and Space Research Centre, led the original award application. They will administer the project and provide final data documentation for the EU. 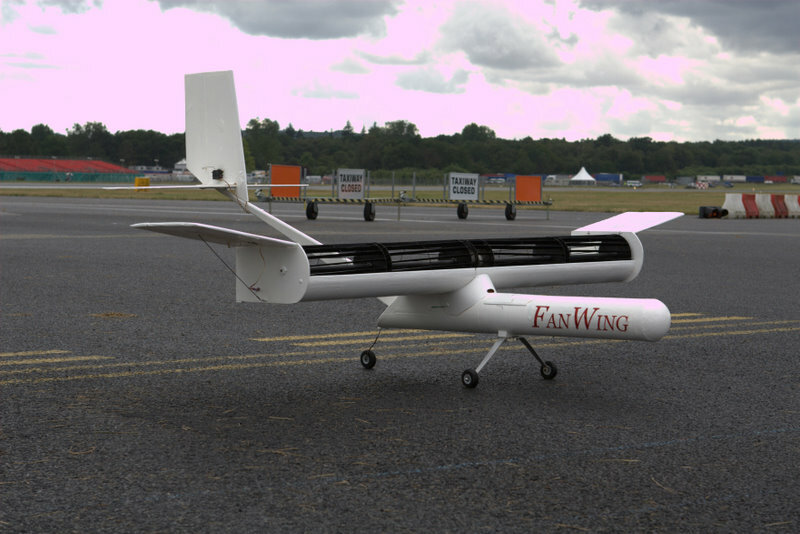 Test models and oversight throughout the project will be provided by the FanWing Company in consultation with George Seyfang. The University of Saarland will provide motors and the actuation process for the rotors. The Von Karman Institute, Belgium will provide wind-tunnel tests and CFD analysis. 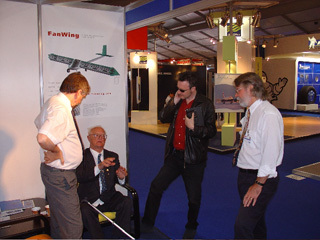 Recent FanWing development has been based on a collaboration between FanWing inventor Pat Peebles and former BAE Principal Concepts Engineer George Seyfang. Following two series of wind-tunnel tests and analysis from January-June 2011 the newly modified TwinTail prototype was first flight tested June 18th and most recently July 16th 2011. The twin tails avoid the strong downdraft immediately behind the rotor-wing and simultaneously exploit the updraft from the wingtip vortex. 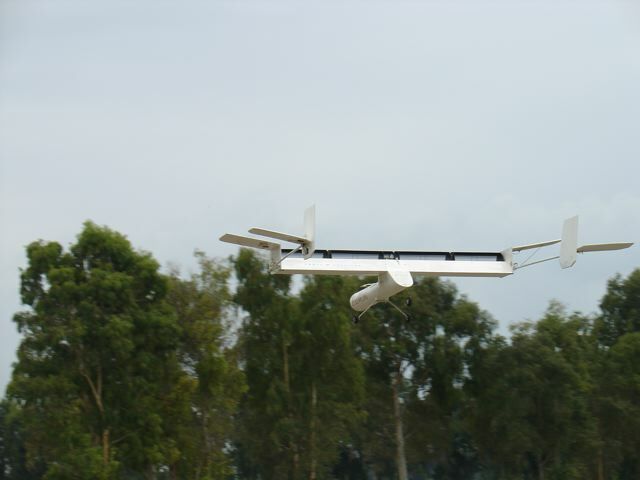 The new development is based on an original suggestion from Seyfang and continues to improve efficiency, speed and stability with the FanWing now capable of reaching speeds of over 70 km/h. The lower end of the flight envelope (performance at low speeds) was also tested with improved stability at between 20–30 km/h. *° Photo shows onboard flow indicators (tufts) and angle-of-attack front sensor. 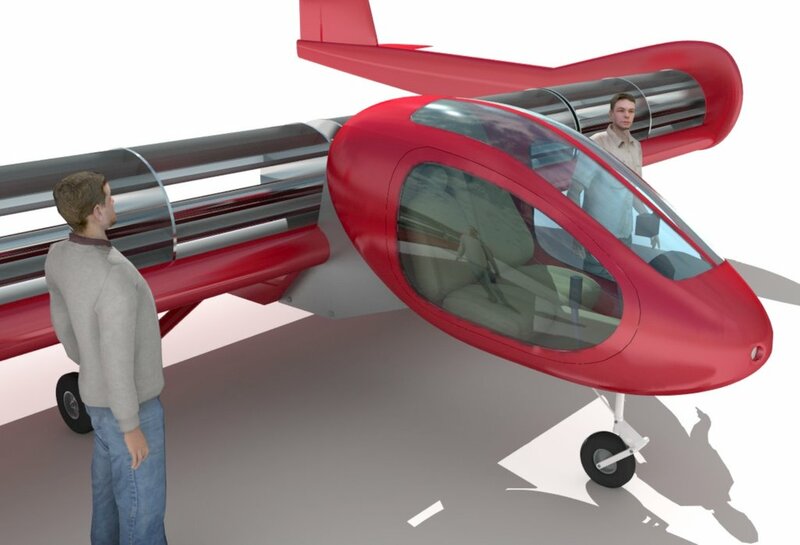 September 2011 Pat Peebles and George Seyfang will deliver a joint presentation at the Broughton Airbus Lecture Theatre UK at the invitation of the Royal Aeronautical Society, Chester. 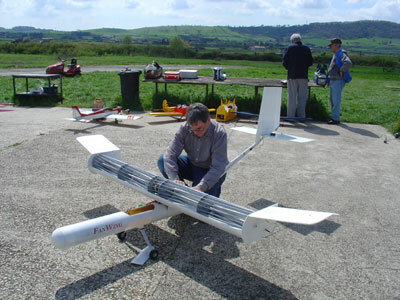 October 2011 George Seyfang will present a paper on the FanWing to the CEAS Conference in Venice. Pat Peebles has recently confirmed a new phase of FanWing development with a radically modified design to increase efficiency. The new experiments are based on suggestions by former Principal Future Concept Engineer for BAe Warton, George Seyfang. Seyfang, previously involved in major BAe projects including the Typhoon, the Harrier and the Concorde, has for many years been interested in potential heavy-lift aircraft solutions. Now working independently, he contacted Peebles early this year with suggestions including speed maximization and also increase of efficiency based on the theory of 'Outboard Horizontal Stabilisers'. (The OHS configuration uses the updraft from the wingtip vortex.) Following a series of discussions and a non-disclosure agreement, Peebles and Seyfang have now made development plans for a new private collaborative project. 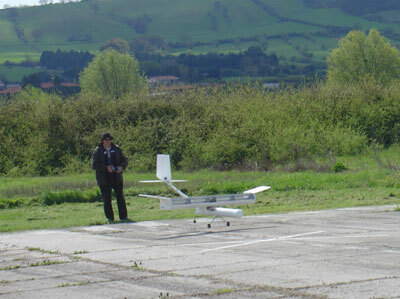 Preliminary OHS concept feasibility flight tests carried out in July in the UK were already positive and now Peebles reports a successfully sustained test flight on the completed new prototype with swift take-off and improved stability and controllability. Peebles comments: "The onboard data logging will provide details regarding efficiencies, but so far as we can judge from this flight, the new prototype seems to be flight performing beyond predictions." Video footage of the newest test will follow shortly. 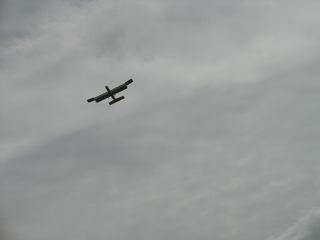 FanWing took part in Farnborough Airshow's first outdoor UAV/S flight displays July 19th, 20th, 21st and 22nd. 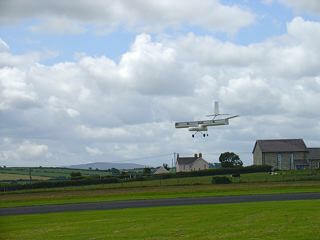 The technology demonstrator was flown by Tony Brock from the Paul Heckles School of Flying. Pat Peebles attended with associate Mike Bednall and with Andrew Thorndyke and Paul Hallahan from Frost and Sullivan. 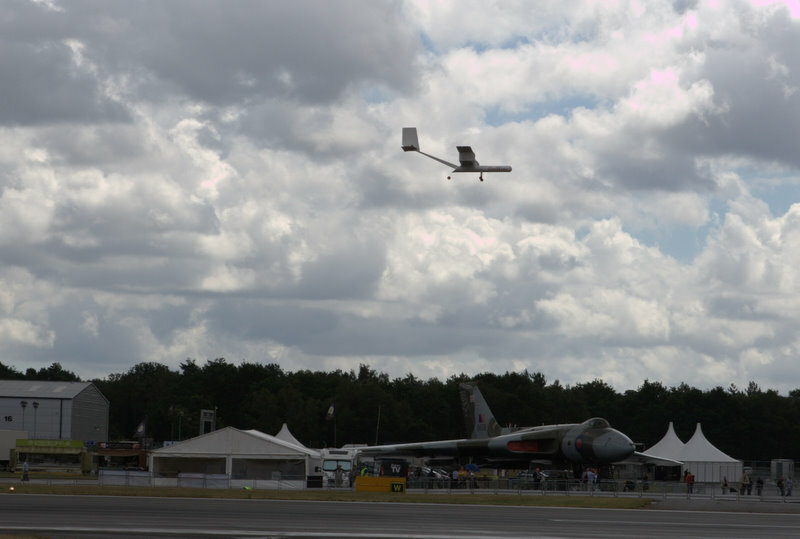 The FanWing UAV as demonstrated at Farnborough is a modified version of the airframe that flew previously in Wales as shown on the home page of this site. Under commercial discussion this year in China, the US and Israel have been development and manufacture of unmanned and manned FanWing airframes for cargo and emergency aid delivery and unmanned airframes to be used for remote sensing in crop surveillance. Images of some of the projected applications under discussion are shown below. Contact peebles@fanwing.com for business information and details of company representatives. Early linear test flights on new rotor and wing-shape modifications show an unexpected rise in efficiency. Onboard measurements are limited but so far indicate up to 35 grams per watt where previous efficiencies were in the order of 29. FanWing inventor/developer Pat Peebles attended the Hungarian Institute of Aerospace Defence annual UAS conference in April as a guest to respond to questions regarding the opening paper and PowerPoint on the FanWing presented by UAS electronics authority Professor Imre Makkay. The presentation paper and PowerPoint had been previously presented by Professor Makkay at an international aerospace conference in Vilnius April 16, 2009. Pat Peebles will be in Washington DC August 5-13 attending the AUVSI.. The FanWing company has recently moved from pure R&D into early-stage commercialisation. Now near finalising its first non-exclusive licensing agreement for production of a surveillance platform (the company in question has since disappeared off the radar...), the company is also in discussions regarding developments exploiting security surveillance advantages and potential heavy-lift efficiency and land-use advantages of larger short/vertical-take-off applications. 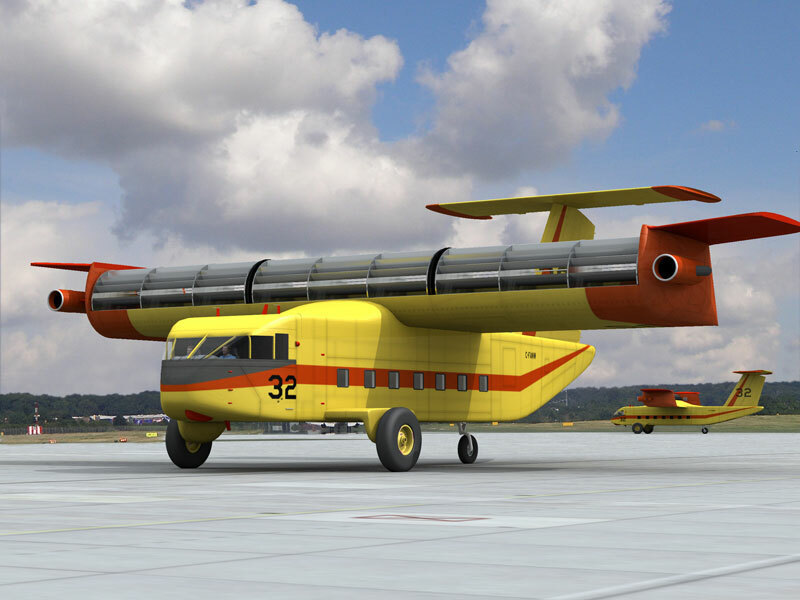 The FanWing company has recently completed formal stages to take forward the most recent VSTOL patent, a modification in design to enable short or vertical take-off and landing, to National Phase in over forty countries. For most recent coverage see the video flight and interview, or for cover of the public UAV event and Farnborough see Armada International and Aerospace International. For a more detailed focus on the FanWing development see Aerospace Testing International for September/October. 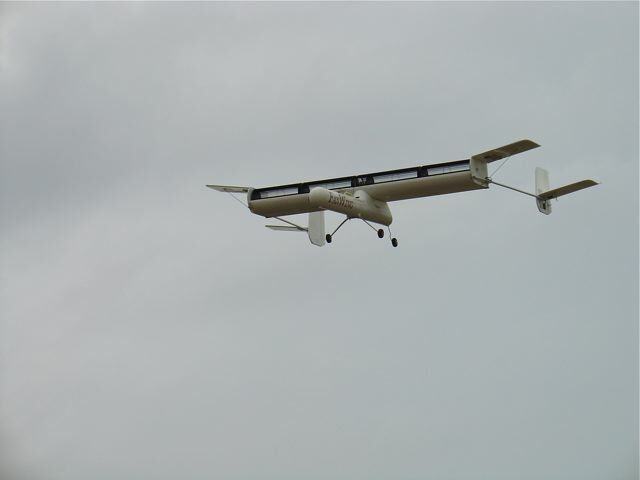 The FanWing Company gave its first public flight demonstration during the international annual Unmanned Systems ParcAberporth Event in Wales in June. Pat Peebles, FanWing inventor and company director, with professional fulltime UAV test pilot Mark Easey, standing in at the last minute, flew the recently modified STOL UAV prototype in two successful flights filmed during practice and then shown onscreen. Both the cameraman and the UAV pilot Mark Easey, initially bemused by the odd appearance of the aircraft, were surprised not only by the short take-off but also by the stability of the two flights even in gusty wind conditions, with Easey commenting: "No doubt about it - this aircraft will fly up and down streets and round corners." The flight videos will be available on this website later this month and will also be shown at the Farnborough Air Show July 14th-18th - see item below. Appreciation to the OnScreen Productions film company; FanWing advisor Mike Bednall; Andrew Chadwick and Mark Easey; Barrie Forster, Mike Wild, Diana Lloyd-Kerry, and all other West Wales Airport and all PAUS 08 organisers and assistants. 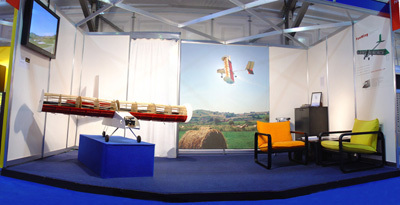 The STOL model prototype flown at ParcAberporth and photographed above will be on static display at the Farnborough Air Show July 14th-18th inclusive in Hall 4, E13 as part of the Farnborough Aerospace Consortium (FAC) exhibit. .Please note that it will not be available for viewing during the weekend. FanWing directors Patrick Peebles and Dikla Peebles will be available to answer technical and business queries. 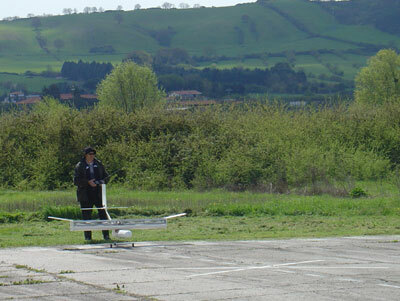 First public flight demonstration of FanWing unmanned prototypes are planned for the annual international ParcAberporth Unmanned Systems Event, Wales, UK, June 25th and 26th, 2008. World Changing Ideas, a new book by Richard Myers and Bob Isherwood, Creative Directors of Saatchi&Saatchi based on the organisation's international biennial innovation prizes, is now on sale and includes a section on the FanWing.. 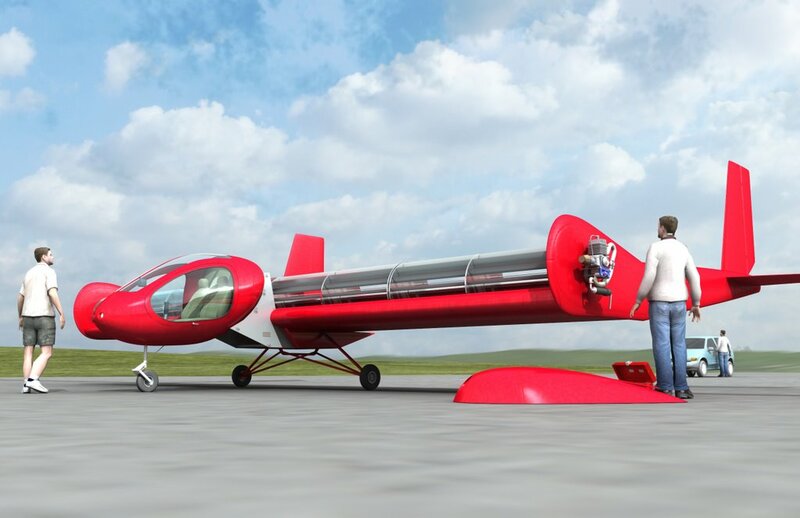 The FanWing Vectored Thrust STOVL R&D prototype, a modification of the original patented FanWing design, is continuing control and stability tests and has now completed the second-phase Patent Cooperation Treaty application. In a separate commercial development a new short-take-off (STOL) prototype UAV designed for easy assembly and transport and aimed at urban surveillance has just undertaken first full flight tests - see photos and video clip below and also two recent Rob Coppinger online pieces in Flight International : (April) (May). Pat Peebles will discuss the FanWing development as a guest panel speaker with Conference Chair Cmd Patrick Tyrrell OBE at the Military Geospatial Intelligence Conference, London May 30th. 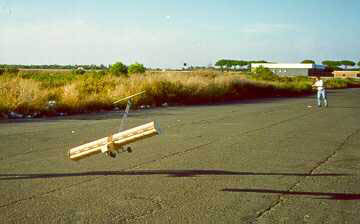 Video clip of second, complete circuit but lower-power (longer roll) test, April 2007, to test control and stability. Flight-test pilot Raffaele Moreschini. Click on picture for download. All photos and clips on this website © FanWing Ltd.
Oliver Ahad's FanWing Ultralight dissertation and simulation project, supervised at Imperial College by Professor JMR Graham and Dr Varnavas Serghides, has been selected this week as one of four finalists in the Association of Aerospace Universities annual Project Competition. Oliver will present a PowerPoint of the project during the Farnborough Air Show Week on July 20th at Farnborough College. 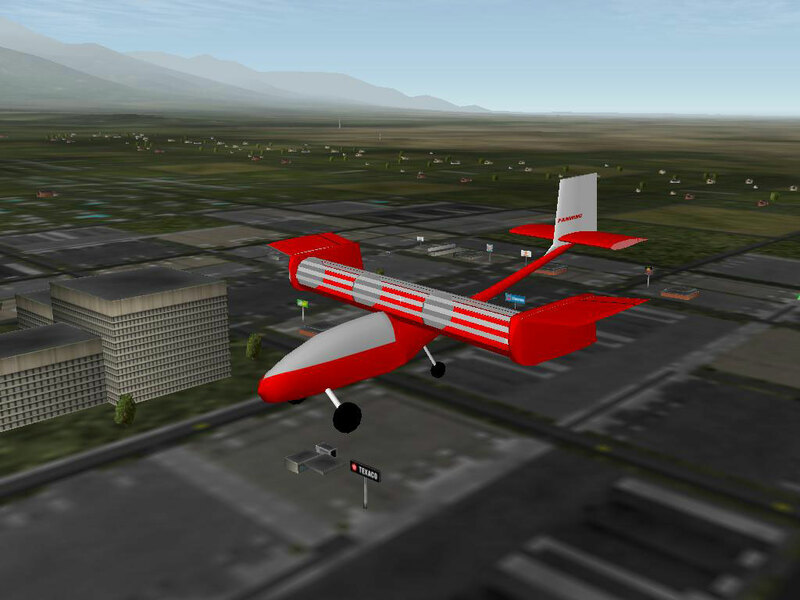 A modified version of the simulation is available here: FanWing Ultralight Flight Simulation with the company's thanks to Imperial College, Professor Graham and Oliver Ahad. 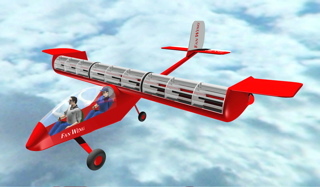 FanWing Ltd has deposited a new vertical-take-off patent application. The initial outdoor linear test hop still on short take-off confirms feasibility of new structural design and efficiency as established previously in indoor tethered tests. The only perceived structural weakness was on the undercarriage, still too light for efficient landing. Next series of outdoor tests is planned for July. 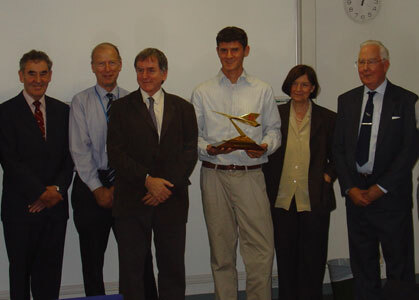 The first piloted FanWing Ultralight simulation project at Imperial College, London carried out by Oliver Ahad supervised by Professor JMR Graham and Dr V. Serghides, was completed June 2006. The company hopes to have shortly available online a brief form of the programme. 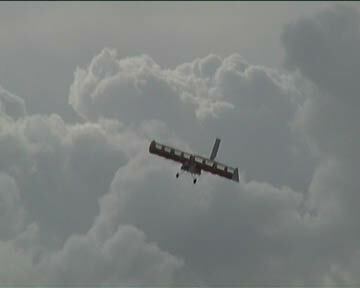 Imperial College reports progress with the new FanWing Ultralight Simulation Project, January-May 31st 2006. The project will establish major flight performance and pilot-control characteristics for what will eventually act as a fire or other application surveillance manned or unmanned Ultralight FanWing aircraft. Screen shots shown below are from the developing project of final-year Aeronautics student and pilot Oliver Ahad, whose FanWing Ultralight MSc dissertation is supervised by Professor J M R Graham in consultation with FanWing inventor Patrick Peebles. Images are derived from Peebles's specifications and computer graphics by Jon Linney, Open University KMi. The Simulator used by Imperial College is a MOTUS Flight Simulation Device manufactured by Fidelity Flight Simulation Inc, Pittsburgh, USA. 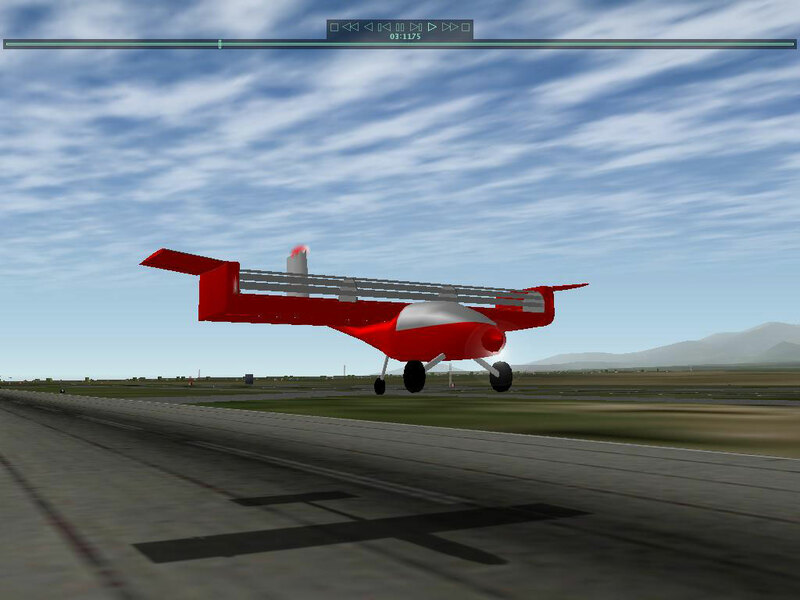 The simulator can be configured to simulate a large range of standard civil and military aircraft, and also non-standard designs, using the Laminar Research X-Plane Flight Simulation software. The cockpit seating and general instrumentation layout is configured to represent a typical light twin engine aircraft. 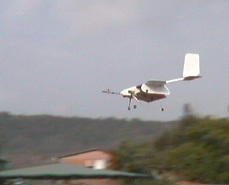 Tethered workshop tests on a small FanWing prototype now confirm VTOL capability. 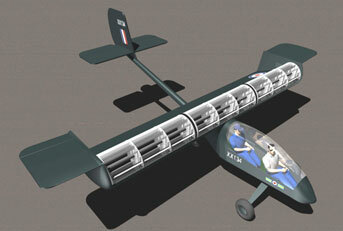 Specifications for the new prototype are: take-off weight: 6kg; wingspan 1.4 m and speeds from 0 (hover) to 75kph. A new IP application is now being initiated, after which more details will be available here. 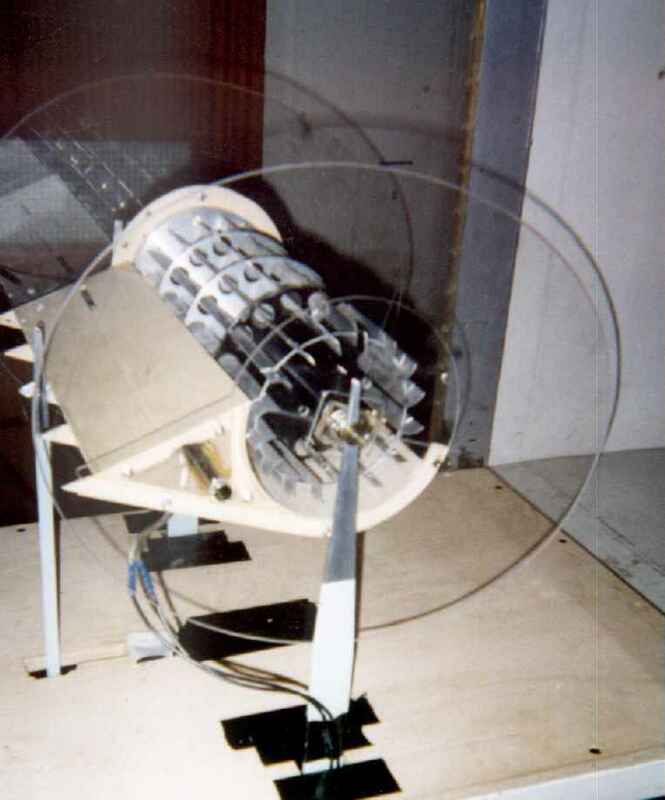 The first outside flight-test procedure (horizontal and then tethered vertical) is predicted for February/March 2006. 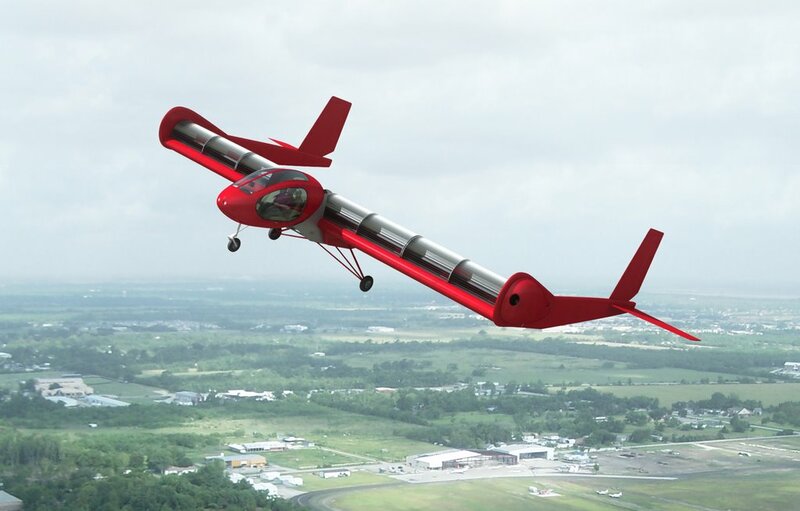 Following continued successful development with increased efficiencies of the UAV airframe prototype (see UAV page), the FanWing Company are now taking steps with UK government backing towards finding major investment and partnership for a first manned aircraft Ultralight prototype. 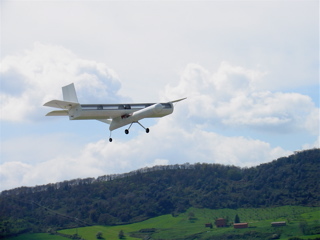 The design work will be followed by an Ultralight simulation project at Imperial College, London, to establish performance and control characteristics. 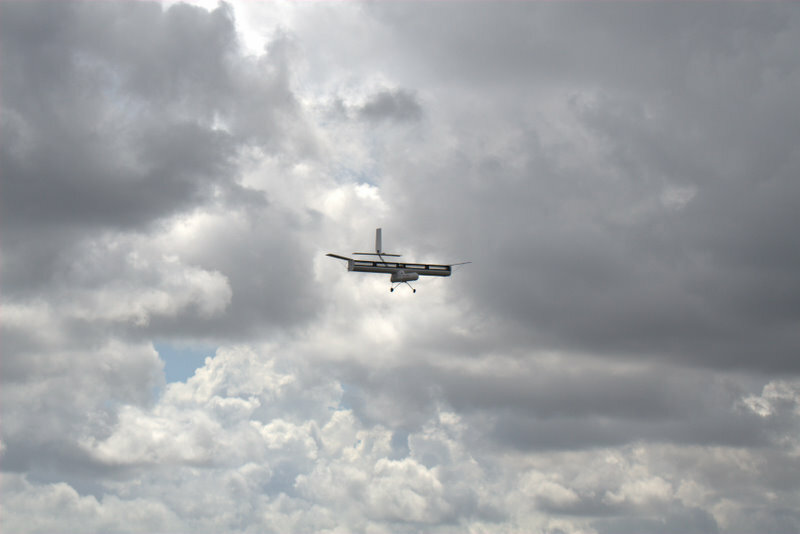 Following weather delays and mechanical setbacks with the new 35 cc 4-cycle gasoline engine (More powerful FanWing set to fly by Rob Coppinger, Flight International, November 2004) new UAV prototype flight tests have now been successfully completed. Video clips are available on the UAV page. Previously predicted endurance with good performance in medium strong winds is confirmed at a minimum 8hrs on 4kg fuel with take-off weight of 20kg. Based on present efficiency results vertical take-off potential is now brought forward with first tests predicted for later this year. 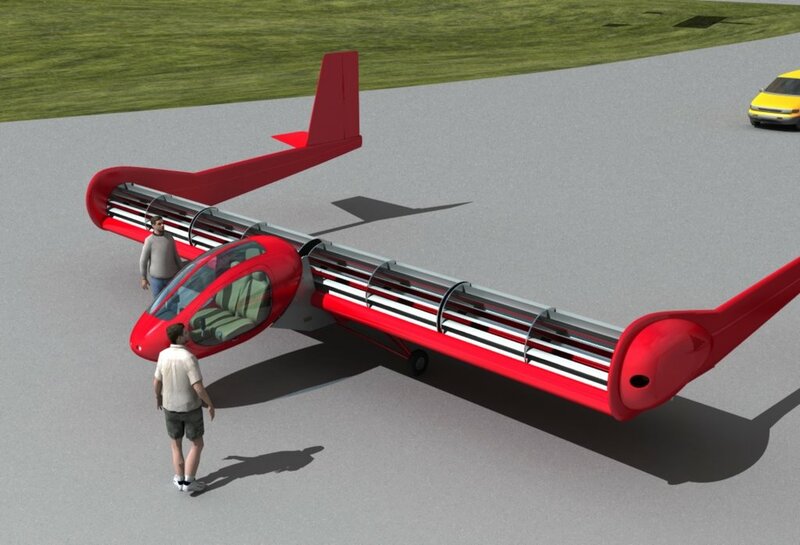 "One of the few truly new aircraft since the Wright Brothers" - The company had an unexpected boost when US science-writer Clive Thompson selected the FanWing for the New York Times' 4th annual Year in Ideas. His lively and supportive piece appeared in the NYT Sunday Magazine, December 2004. March issue Popular Science (US) also contains new coverage. We report with great sadness the loss of our long-time UK Government business mentor and friend, Professor David Nicholas, a source of quick insight, enthusiasm and energy to all who knew him. Involved in the original Hovercraft initiatives David from the earliest days of his professional life had an inside track on the frustrations and excitements of innovation development and became a committed and idealistic champion of new companies and individual inventors. David was a natural connector of people with enormous personal warmth, brilliance and humour. He will be greatly missed. "It may be that the FanWing becomes as common as the helicopter" - a new article on the FanWing this month by Tim Robinson, News Editor of the Royal Aeronautical Society magazine, Aerospace International, concludes that the FanWing could just "herald the development of a whole new niche air vehicle." See the piece in full on this site's articles page and for more details about the RAeSoc magazine see www.aerosociety.com . Robert Thielicke interviews Pat Peebles on the FanWing development in the November issue of Focus Magazine, German edition. More information with a link to this article later. "Arguably the most unusual exhibit at the show, the diminutive FanWing unmanned air vehicle marks success in a new field of aerodynamics." - Brian Walters, writing in Aviation International News, helped to launch an unexpected new take-off for the FanWing Company in its debut public appearance at the Farnborough International Air Show. Pictured in photographs from left to right, Pat and Dikla Peebles with stand visitors, Pat and Tony Pitt with Fred Clarke and Alex, Tony Pitt with stand visitors. 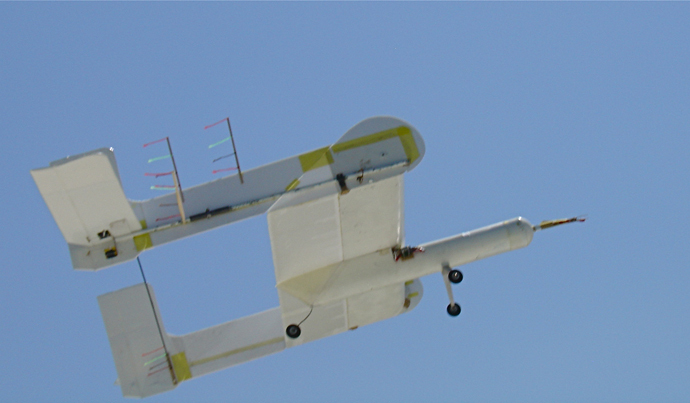 We are happy to report that the World Technology Network has announced its nomination of FanWing inventor Pat Peebles for one of its 2004 Awards. The WTN awards are sponsored by CNN, Microsoft, NASDAQ, Science Magazine and Time Magazine. Nominations are based on peer input from previous winners who are asked to select people who in their opinion will make most impact on the future in his/her particular field. For more information see www.wtn.net. 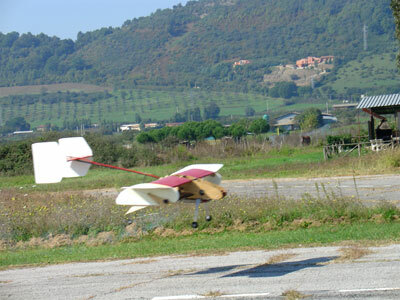 New UAV developments have resulted in new take-off weight now at 21kg and still rising. 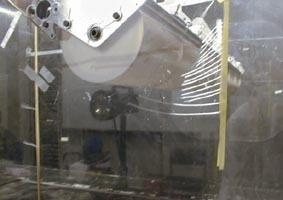 Speed is now up by 50% on January measurements with a new control system and glide is now 1:4. 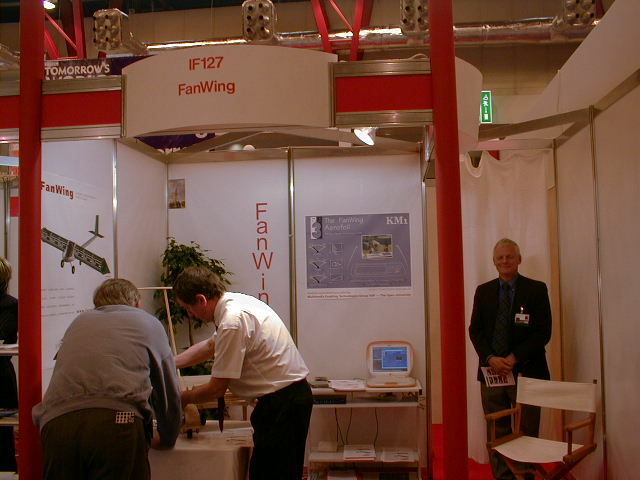 FanWing Limited has just had confirmed the private sponsorship of a small stand at the 2004 Farnborough Airshow July 19th-25th. 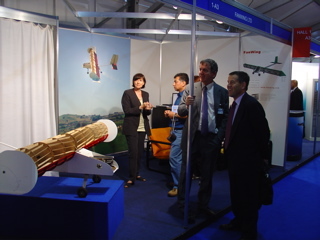 For further details see www.farnborough.com and come and visit us in Hall 1 Stand A3. (Please check for trade show days and public days) We plan to have full flight videos as well as the actual SMART MURCH UAV prototype - a little flight worn - and Pat Peebles will be there to answer questions. A full proposal for the new project has recently been invited by the US Government and will be submitted later this month. We are pleased to confirm future collaboration in the proposed project, which is also presently under consideration by the UK Government, with Professor JMR Graham and Professor Max Platzer. 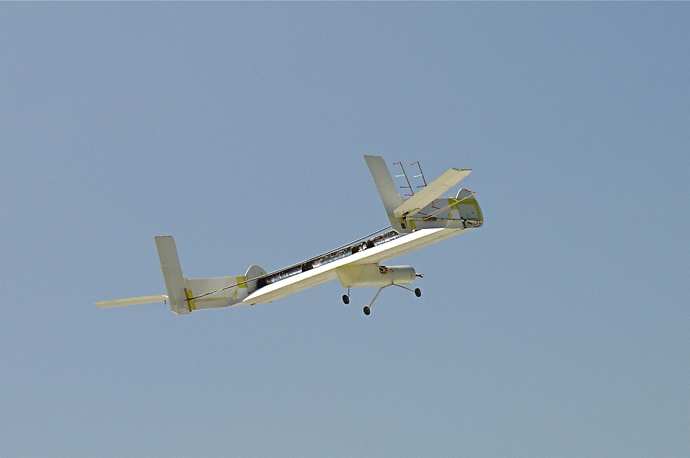 Following the steadily increasing lift efficiency of the recent UAV prototype, the new proposed FanWing project planned to start later this year, will double its present weight, opening the airframe to heavier payloads, including radar, for long-duration surveillance both in the military and civil markets and will work towards vertical take-off. 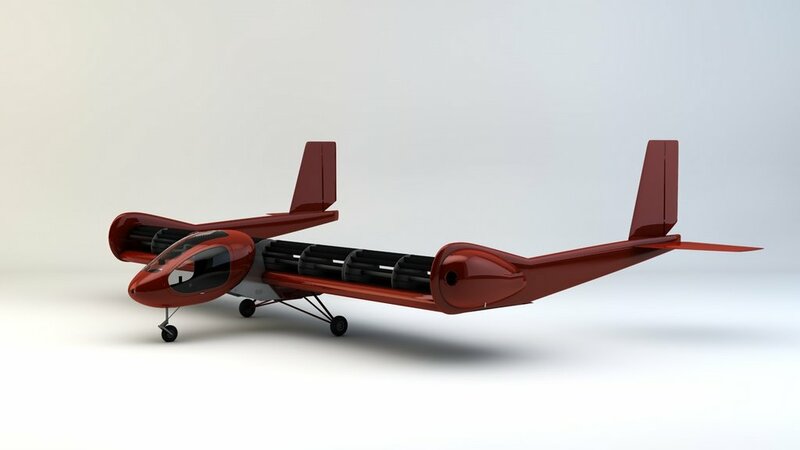 The proposed new project will also provide valuable data for the company's projected development of the first manned FanWing, a two-manned ultralight. The UK Government have also already funded development with a new SMART Micro award of a downsized version now in initial design process. Development continues on the UAV airframe thanks to the UK Government and private FanWing Company US co-funder Creighton Murch. 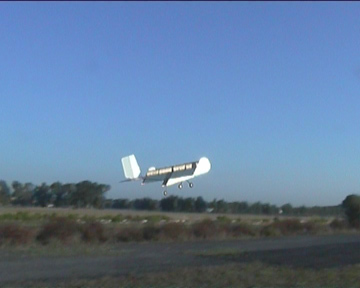 There was unusual lift performance last week of the new UAV FanWing SMART 2.2m wingspan prototype. 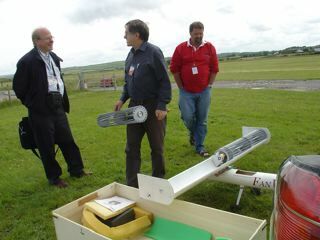 (see pictures in earlier news item) With added winglets the FanWing successfully flight tested with an 8 kg (lead weights) payload and a total weight of 17.5 kg. Take a look at the November 5th clip on our flight clips page. 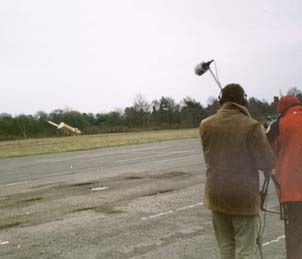 The first surveillance test with onboard video equipment and radio contact with a computer on the ground has now carried out successful filming. We have flight clips from above and below on the video page. 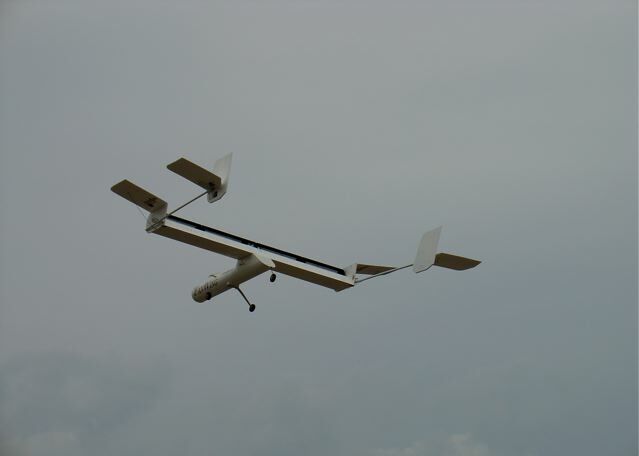 New test flights on the recently completed UAV prototype airframe show excellent control and lift with the usual fast take-off. Thanks to our new pilot Raffaele Moreschini. The prototype is under second-phase development thanks to private investment from Creighton Murch. Forthcoming tests will include surveillance equipment and increased payload. (Payloads have been tested up to 4kg) Flights can be viewed on our flight clips page and we hope to have more pictures and technical details available on this website soon. A new FanWing patent was deposited at the beginning of September. Thanks as always to Roy Barlow and J A Kemp & Co.
Patent agents Kemp & Co, London have now confirmed the US issue of a Vortex Flap Patent (already issued in the UK) to add to the basic FanWing Patent. The FanWing has been short-listed for one of Saatchi & Saatchi's 2003 Innovation in Communication awards. Pat Peebles, inventor of the FanWing, and Daniel Peebles, company website tech advisor, are attending the upcoming Saatchi award event in New York. This year's eleven finalists, including a model prototype of the FanWing, will be exhibited at the ACE Gallery in Hudson Street. 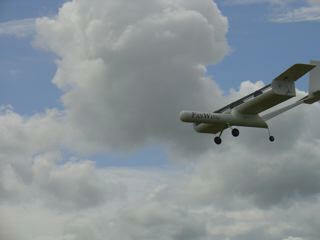 The new model prototype FanWing will be ready for demonstration in the UK later this year, we hope by late September. Wing-span will be seven feet/2.2 m, with a payload of 4.4 lb/2kg. Surveillance equipment for the FanWing airframe will be supplied by Remote Aerospace Limited, one of our project collaborators. New wind tunnel tests are being planned by the company to take place at Imperial College, London. The company is also now aiming towards development of a mine-seeking application where the slow and detailed security sweep possible with the FanWing along with the economy and simplicity of design could be particularly valuable. Thanks to David Nicholas, Business Link Wessex, who kindly received the UK government SMART certificate and award on FanWing's behalf at the formal presentation ceremony on February 18th. We are looking for company partnership. Our aim is to find a company/organisation with relevant aeronautics experience in materials or in overall development of experimental aircraft to participate in funding application, administration and technical running of the next stages of the UAV or manned projects. We are grateful to Peter Holtby of the UK Society of British Aeronautics Companies for helping us here with their new datebase and we as always welcome all suggestions. Welcome and thanks again to new and our original private investors who are with recent injections of capital making the continued development possible. Media interest continues to grow after the Newsweek article (see articles page) sparked attention originally in November 2002. We have now been approached by several TV companies regarding documentary coverage and possible films in the UK, US and Italy. We are also grateful to the friendly editor of the aviation journal US, Pacific Flyer (www.pacificflyer.com) who has not only included a nice piece on us but also accepted an invitation to be a guest on the third flight of the manned FanWing... We have also been invited for inclusion in an international travelling European educational exhibition to be sponsored by the European Patent Office. The project has unexpectedly hit the news in these weeks. Newsweek International published a two-page article on Pat Peebles and the FanWing in their 11th November edition. (see our articles page) Satellite BBC TV World News and The Independent (UK) almost simultaneously came out with their own FanWing interviews and Italy has followed up with the Messaggero, Repubblica and RAI's TG2, with more RAI 3 coverage to come, as well as an article to appear in the spring from La Macchina del Tempo. Denmark, France, Germany, Holland, have already produced or will produce their own pieces . Our thanks here to www.newglobalnet.com . A fatally attractive piece on the popular technical news site http://slashdot.org/index2.pl?fhfilter=fanwing led to thousands of FanWing hits an hour and our website finally crashed. Robert Gable instantly came to the rescue. We think this excellent server never sleeps. 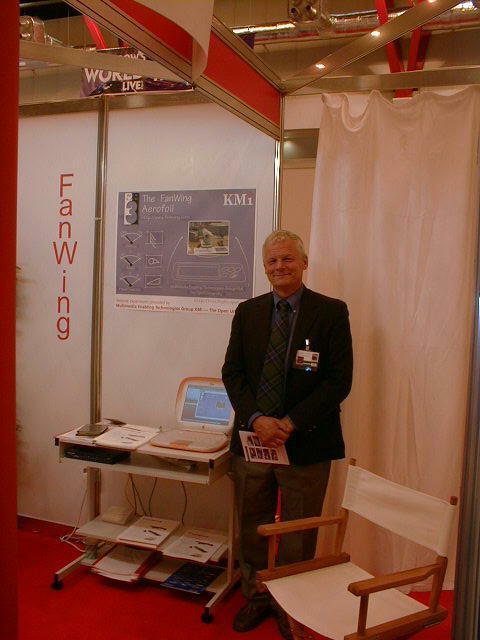 FanWing Ltd. welcomes UK business consultant, Rawle Michelson. Mr. Michelson began to help us earlier this year when we first started to look at major sources of private financing. He and David Nicholas from Business Link Wessex (see news below) are continuing to guide our company through the new investment and funding developments. There were several other people too who generously helped us earlier this year when we ran into the Catch 22 of most innovation companies - we couldn't afford the help we needed to raise the money we needed to get the help we needed... Christopher Arnander, Charles Blount and Simon Hudson, Paul Evans, Bryson Farrill, Bryan Graham, Gordon Midgeley, and Susan Smith all gave time, funding consultation, contacts, encouragement and in the case of City Insights, the offer also of London office back-up. Enormous kindness, practicality and professional wisdom here. And the usual thanks to the investors who continue to keep us flying, with a special mention of Creighton and Janice Murch, who have recently turned our company round with an unusually generous (and unencumbered) private investment. Early in November the FanWing team spent time in Washington DC, hosted by company advisor, Loretta Schaeffer, together with GianCarlo Guarda, for the week of the American Institute of Aeronautics and Astronautics International Conference on Powered Lift. Pat Peebles gave a brief presentation at the conference and we were pleased (and surprised) first that so many people attended the lecture at all, and second, that so many were so openly appreciative of such a maverick invention. Apologies to those of you who emailed us for information on investment and technical aspects of the invention and who have not yet received a reply. After the unexpected increase in response we are catching up, but slowly. We have no models/plans to offer at present but hope to be able to supply some next year. 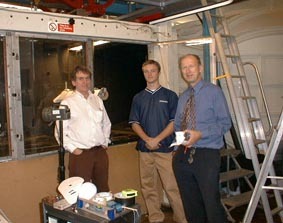 During September intensive wind tunnel tests were carried out at Imperial College as part of the UK Government SMART award UAV project (see August update) FanWing inventor Pat Peebles worked with the assistance of Klaus Koegler and in consultation with Professor Mike Graham, Head of Aeronautics at IC. Results of repeated tests on the newest wing design - one metre rotorspan - show a nearly 50% increase in efficiency over Klaus Koegler's previous M.Sc.dissertation findings (see July update). Predicted lift is now two tons with 100 horse power. 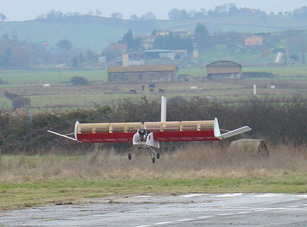 Autorotation tests show a glide angle of 22°. We are pleased to announce that the FanWing Company have now received a UK Government Department of Trade and Industry SMART Award, given to establish the feasibility and initiate development of a commercial FanWing Unmanned Aerial Vehicle or UAV, for use in remote controlled surveillance. 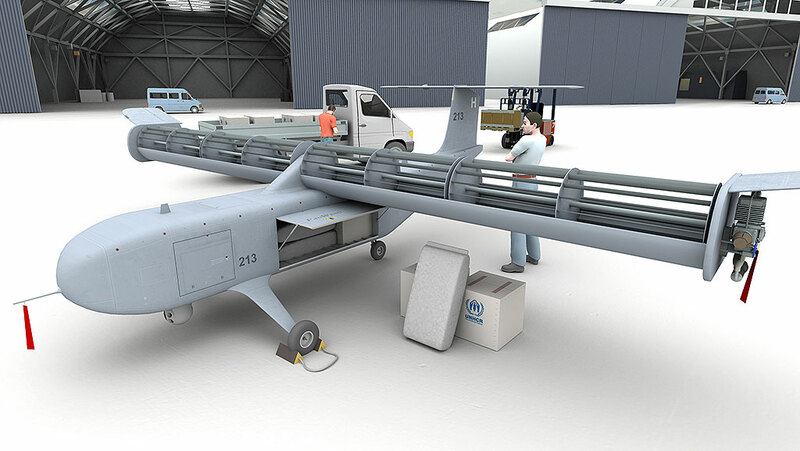 The twelve-month project, already begun, will be carried out in collaboration with Imperial College, Kingston University, and the UAV company Remote Aerospace Limited. Marketing consultant will be Tony McGarry. Thanks to: the Department of Trade and Industry, who granted the award in conjunction with the European Union; to Tony Howells, Katie Osborne, and David Wright of the SMART and Enterprise Team, who together approved and administered our application; to our future project monitor and guide, Tim Anderson; to Business Link Wessex, who support inventors and small businesses with such pleasant efficiency online and off; and a special thanks to David Nicholas, who has personally done so much and whose Virtual Company concept has been so helpful to our project. And as always our thanks to the private investors who have supported us throughout, who most recently provided the balancing funds for this prestigious grant; and without whom none of this would have begun to happen. 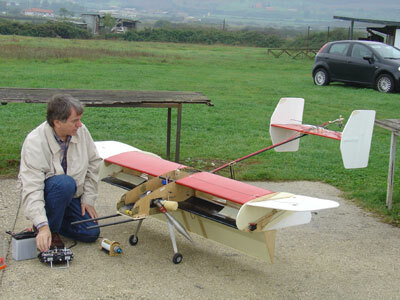 Two new flying prototypes have now been constructed: one with 60cm rotorspan, 800g weight and the other 1m rotorspan, 2.2kg. We hope to get pictures and flight clips up soon. There are improvements in both glide and efficiency. News from Roy Barlow, our Patent Agent from Kemp & Co. London: The most recent of the FanWing patents - covering the Vortex Control Flap - has now been approved for grant by the UK patent authorities. Pat Peebles, inventor, designer, constructor of the FanWing, will be making a Powerpoint presentation on various aspects of the new technology this November in Williamsburg, Virginia, at the Biennial International Powered Lift Conference. The conference is organised by the American Institute of Aeronautics and Astronautics in collaboration with NASA and sponsored by the Royal Aeronautical Society and the American Helicopter Society. Congratulations to Imperial College aeronautics graduate Klaus Koegler on his FanWing MSc.dissertation, prepared under the supervision of Professor J.M.R. Graham. 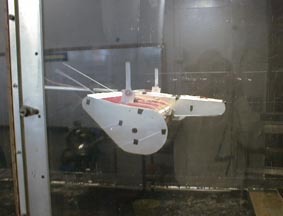 Klaus tested a FanWing in both water and wind tunnels. 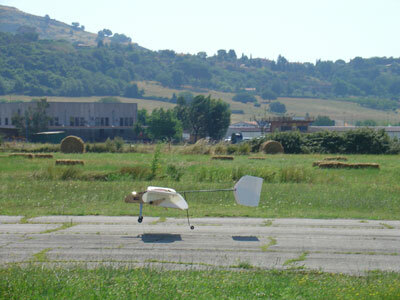 His conclusion: the FanWing at slow speeds shows a 35% improvement in efficiency over the helicopter. We are very happy to hear from Peter Talbot of the Royal Aeronautical Society, Chester Branch, that Pat as inventor of the FanWing has been nominated for the annual Royal Aeronautical Society Award for "Outstanding Achievement in Aerospace"
A propos of this and the joint presentation made by Pat and Dikla Peebles to the Chester Branch of the Royal Aeronautical Association and the Institute of Mechanical Engineering: we are printing a photograph below and our thanks again here to our hosts for their extraordinary welcome, enthusiasm and hospitality. You can see Chester flying on our video clip page. 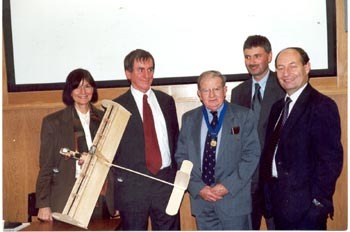 British Aerospace Lecture Theatre, Braughton (From right to left) Keith Manns, Director, Royal Aeronautical Society; Phil Welsh, Senior Officer, IMechE; John Young, Chairman, RAeS, Chester Branch; Pat Peebles, Inventor of FanWing; Dikla Peebles, Chairman of FanWing Ltd.; Chester. 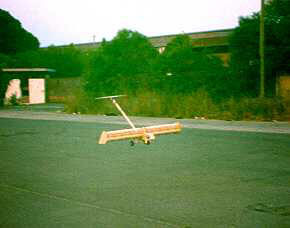 The most recent and so-far smallest model FanWing, (rotorspan 70cm.) is already performing well in its initial hops and is intended for the leisure and show model market. Photographs and full flight video clips will be uploaded by late April. David Nicholas, Virtual Company, Business Link, Wessex, UK. David has been responsible for some major strengthening of our company policy and approach over the last few months. With these recent collaborators and under the guidance of our company advisors (listed on our Company page) plans are now underway for a research and development project to produce an unmanned aerial vehicle (UAV) for commercial surveillance purposes. Two UK universities, Bristol and Kingston, are now including the FanWing as part or whole of new M.Sc. 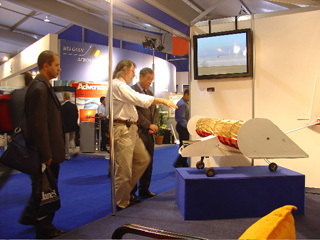 programmes in aeronautics. Thanks also to Kingston and Dave Edmondson in particular for ongoing support and advice on our project. Check out our articles page for the recent piece on the FanWing run by Aero-News Network, a US based website. Following the successful flights of the two newest models and the encouraging response to our recent public UK presentation (see below for some details of this lecture) we are now preparing a major funding drive to support development of both the drone and the manned versions of the FanWing. Applications are already in the process of being submitted to various public funding organisations (with the support of a UK organisation called Virtual Company) and on top of our ongoing private sale of shares we will also now be approaching venture capital sources. Flight clips of the latest and smallest model of the FanWing, (80cm wingspan and 600g weight) will be added to the website as soon as possible. 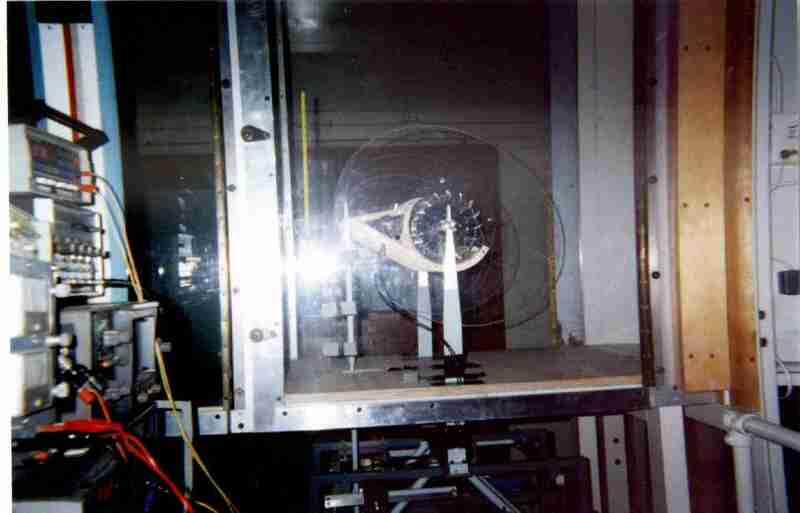 As well as the already planned second series of wind tunnel tests at Imperial College, London, new plans for a student project to start in 2002 are now confirmed for the Wrexham University of Wales Associated College, UK. 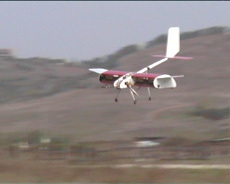 New FanWing model 8 flight video clips are now uploaded. 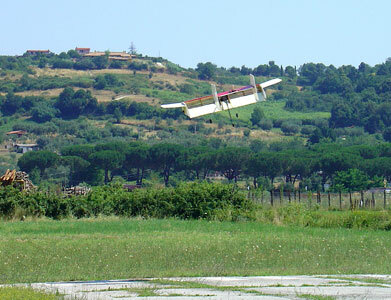 The new larger FanWing Model 8(wingspan 1.80 m. 6kg.) has had some good flights. We hope to get new pictures and video clips uploaded as soon as possible. Flyer Magazine has a short item on FanWing this month. We'll get it scanned and onto our publications page. By Pat & Dikla Peebles - FanWing Ltd.
We participated as planned. 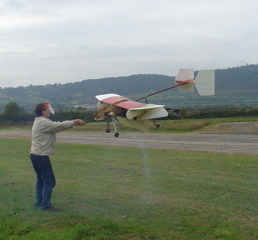 The FanWing (original small model seen in video clips already on this website) flew as well as ever until a pilot error (yes we would say that, but it's true - this particular model has always flown and landed perfectly before) led to a crash. Pat was given an award for 'a new propulsion system.' 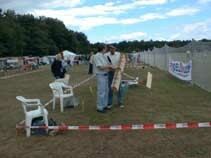 It's a great show, excellently organised, held either in Germany or in Holland annually. See their website address below. Thoroughly recommended. 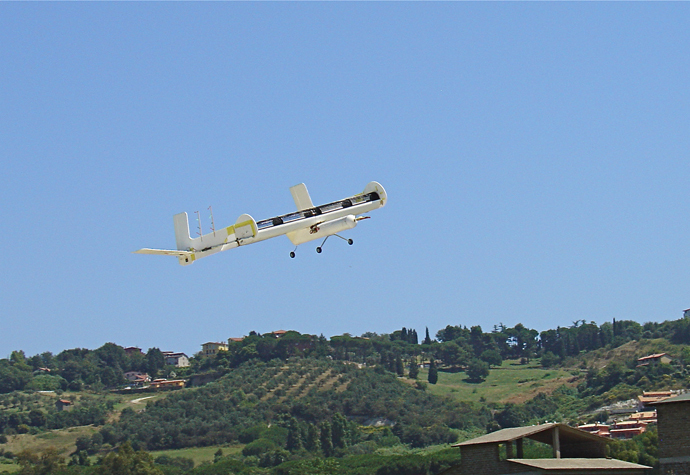 Peter Talbot, Programme Secretary for the Chester branch of The Royal Aeronautical Society, has invited us to give a presentation of the FanWing project at the British Aerospace Lecture Theatre in Broughton, UK. 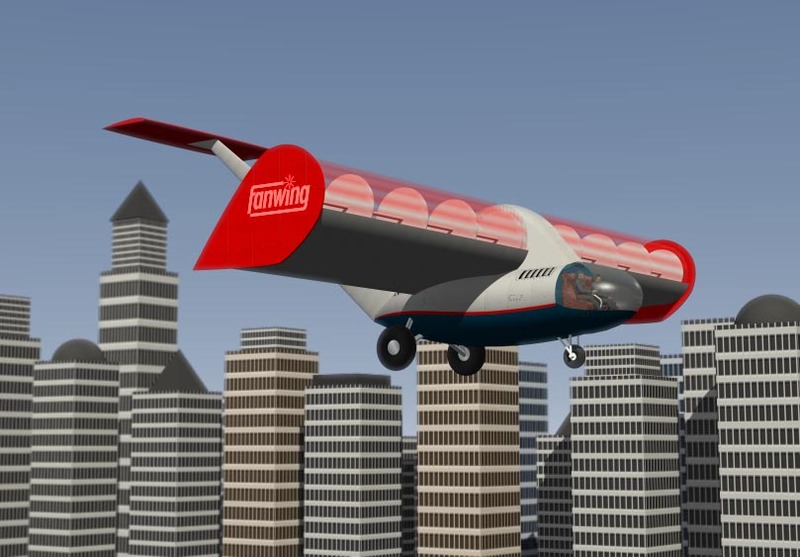 The ninety-minute lecture, to be called The FanWing - a New Concept in Aviation, will be on November 14th and will include video recordings of various flights, features of the wing's rotation and wind tunnel experiments. We will be flying a new FanWing prototype at an international show of experimental aircraft models to take place in Holland on the 4th and 5th August this year. 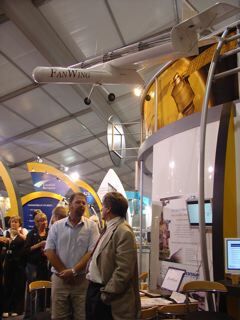 Oval Films for Discovery Channel (Europe) have now completed the documentary piece on the FanWing. The series is called Pure Invention. Filming of the recently modified plane in London went well. There have been vast improvements. We are now working on transferring some of the flight clips to this website. Thanks to Ronnie Myhill and John Ackroyd for joining us there. We have had a piece on FanWing in the UK magazine Professional Engineering. Read it in our articles section. We cannot answer individually all your messages - so briefly: share sales for the second issue are now officially closed. Thanks to those people who have shown such enthusiasm and support for this venture. BBC Fair: hundreds of visitors, useful discussions, a gold award from International Institute of Innovators. Good to meet some of our website contacts there and also talk to some of the interesting people out there in the inventing world. There will be articles out soon and a TV company (Oval Films) is filming a short documentary piece about Pat and his work, to be shown on Satellite Discovery Channel in 2001. 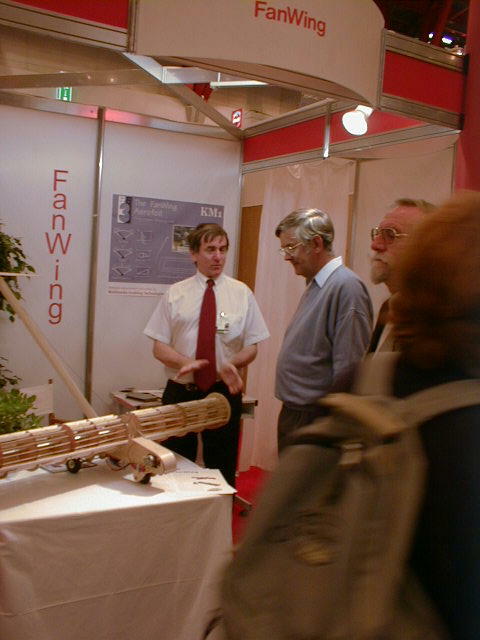 Peter Whalley and his team at the Open University for setting up (a) the video loop of an actual FanWing flight for those people who looked at our stand model and said 'Yes but does this crazy machine work?' and (b) a computerised windtunnel interactive experiment Peter put onscreen for the stand for our visitors. And finally and of course: our investors, who show such faith in us and without whom none of this would happen at all. We're at stand IF127 so come and visit us here. 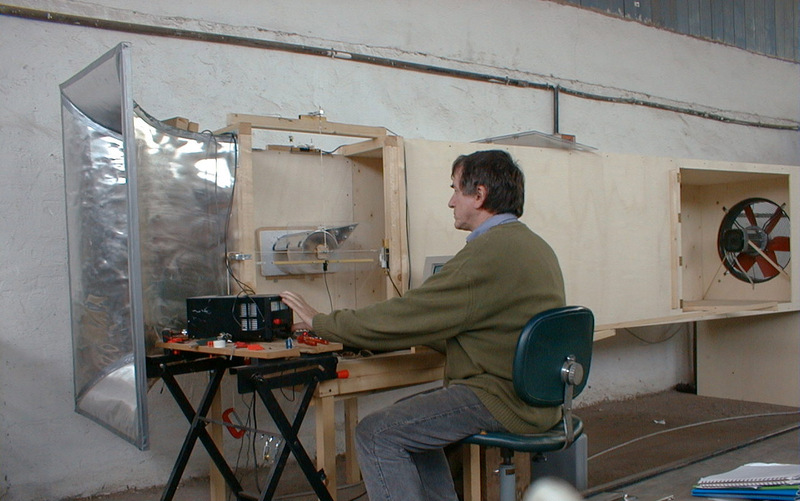 Dr Peter Whalley of the Open University, UK, (whose Knowledge Media Institute team has already produced some of our great artwork projections of FanWing and the animation here on this website) is now working on a model of the wing in a wind tunnel to work on in real time. 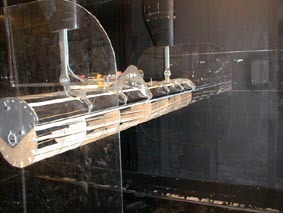 The small wind-tunnel model for this computerised version is being constructed for us by Pip Youngman of the future Arthur C Clarke Centre in Taunton in South West England. The newly formed Private Limited FanWing Company's functions are to hold the Patent Rights; to protect and further our shareholders' interests; ensure the proper research, development and eventual sale or licensing of the FanWing aircraft. "A comparison was made between a FanWing aircraft and a conventional helicopter and the power consumption per Newton weight lifted was within the same range. 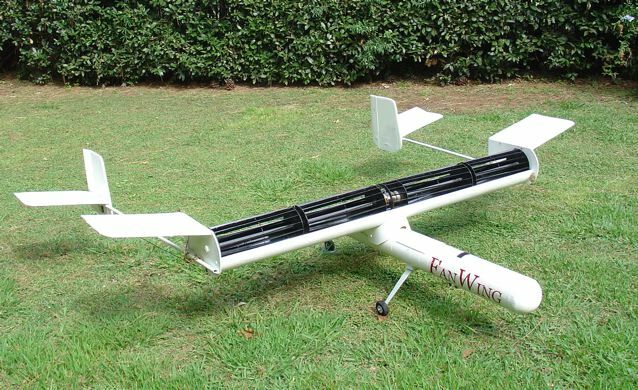 With good design the advantages of the FanWing is that it would be much quieter and that it has a much less complex rotor system than a helicopter." "...the FanWing cannot autorotate in the same way as a helicopter. If manned flight were to be considered, then for safety reasons the use of backup power systems or alternatives to autorotation must be considered." 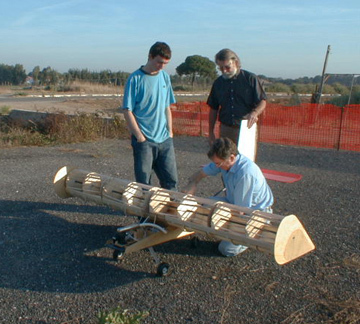 Note: ( 15 May 2001 ) We have made a breakthrough with the latest wing design. 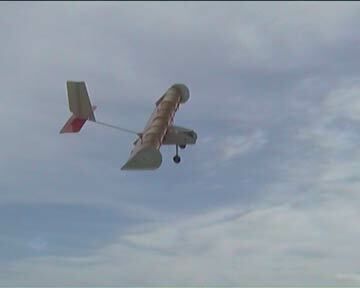 The FanWing now glides with a rotor autorotation speed already high enough to effect a controlled landing. BBC's Tomorrow's World included FanWing in their February 24 programme. 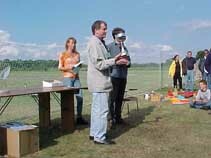 Pictures of the first successful flying model.